Ok- Well, we have had a horrible time getting McKenna’s first pair of glasses. From waiting 5 weeks to get them, to the clerk at Sears stashing them in a drawer; not sending them, and then quitting without so much of a note to another clerk to send them. But they finally came back with the lenses today, although we are taking her to get them fitted and the temples rounded to fit around her ears, I had to take pictures!! I put them on her and she left them on for about 15 minutes while I was holding her in my lap. When she was on the floor and trying to crawl however, they began to slip, so she quickly pulled them off. She did though bring them to me to put them back on her, but they wouldn’t stay on. I am hopeful that once they are fitted more properly, that she will forget that they are there and leave them be. 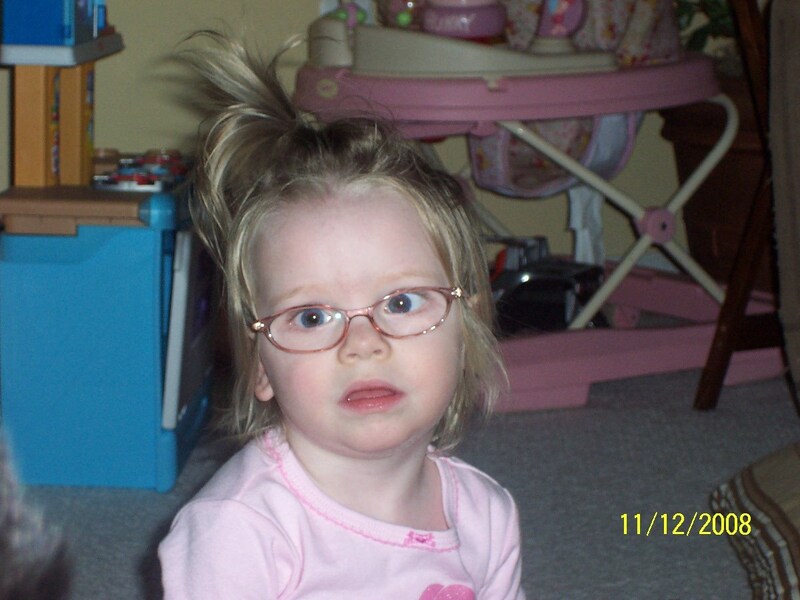 Then we will focus on the benefits of the prescription and its effect on her esotropia and farsightedness. ← But he’s so cute! Oh, they’re cute! She does look a bit confused about what’s on her face. I bet they’ll work better once they’re fitted correctly.